The U.S. military would most likely not use nuclear weapons in a war with Iran, a former top Defense Department official said Tuesday. 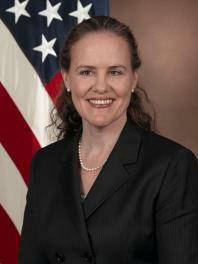 Michèle Flournoy, undersecretary of defense for policy from February 2009 to February 2012, was part of a roundtable of former Pentagon officials at Third Way, a left-leaning think tank in Washington. The U.S.is prepared if it needs to use military force against Iran’s alleged nuclear weapons program, Flournoy said. But when asked if the Joint Chiefs of Staff might recommend using nuclear weapons against Iran, Flournoy said a war with Iran would not escalate beyond a conventional conflict. “I think that’s a hypothetical scenario that is highly unlikely because I don’t think we’d ever get to a point where the chiefs said they had no other options but the nuclear option and would present that to the president,” she said. USA probablemente usara su arsenal nuclear dependiendo que Iran le tire a Israel cohetes conteniendo mortales viruses biologicos y quimicos. Mientras no lo haga usara sus armas convencionales. Los EU no seran los primeros en usar las bombas nucleares. Pero no vacilara en usarlas en caso de que Israel sea atacado con armamento de exterminio masivo por parte de Iran. President never will use the arsenal nuclear unless Iran decide to attack Israel with bio- chemical armament. Then EU will retaliate. EU eill continue using their conventional arsenal no- nuclear. Iran is a suicidal fanatic state. EU doesn’t cares the Iran’ s fanatism. Iran can’ t win a war vs EU. EEU has ” secret weapons” never used in a war. One if them were used in Irak with exit. It was the “awe” bomb mini- nuclear. Just a small version of the big one. It is the fact. Russians are no that crazy to start a 3que world war. Conventional arms will be used. Neither Russia or EU will start a nuclear war. If Iran start it Russia will knows Iran was the first and USA has all the right to respond to Iran. They are not stupid. They don’ t risk his country for such a fanatical miscalculation shot speaking about bio- chemical o nuclear arsenal. Russian knows once Iran ise their bio- chemical armanent against Israel the hell gates will be open.